Tag line: "The most incredible plot to conquer the world!" I’ve known of the existence of They Saved Hitler’s Brain for years (with a title like that, how could I not? ), but had never seen it before. 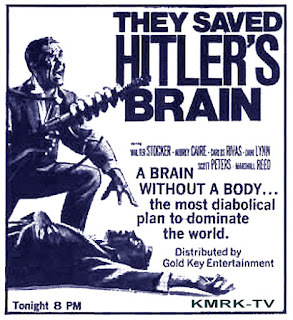 A made for TV film that combined 1963’s Madmen of Mandoras with about 30 minutes of additional footage (shot years later by UCLA film students), They Saved Hitler’s Brain is, alas, a science fiction movie that’s never as interesting as its title would lead you to believe. While investigating the murder of a scientist (whose car blew up as he was transporting a secret formula), C.I.D. agents Vic Gilbert and Toni Gordon witness the kidnapping of a Dr. Coleman (John Holland), who has been working with a nerve gas powerful enough to wipe out an entire city. Hoping to rescue him, Dr. Coleman’s daughter Kathy (Audrey Caire) and her husband Phil (Walter Stocker) travel to the South American city of Mandoras, where a renegade group is supposedly holding both the good doctor and his younger daughter (and Kathy’s sister) Suzanne (Dani Lynn) hostage. Aided by a handful of locals yet never quite sure who they can trust, Phil and Kathy eventually discover that the organization behind Dr. Coleman’s kidnapping is none other than the dreaded Nazi party, which, under the leadership of the reanimated head of its Fuhrer Adolf Hitler (Bill Freed), is once again trying to take over the world. The additional footage created especially for They Saved Hitler’s Brain (the C.I.D. agents’ investigation) was done solely to pad the movie’s runtime; the sequences don’t gel at all with the rest of the movie (based on the fashions and hairstyles alone, it’s obvious these scenes were shot years later), nor do they add anything to the overall story. But then, most of the movie (including the entirety of ‘63s Madmen of Mandoras) just kind of sits there, spinning its wheels and never getting anywhere. Not even the scenes featuring Phil’s and Kathy’s search for Dr. Coleman generate any real excitement; they uncover clues and interact with a few native Mandorans, including Police Chief Alanis (Nestor Paiva) and Camino (Carlos Rivas), an underground rebel whose twin brother Teo (also played by Rivas) was one of Hitler’s personal physicians during the war. Aside from this, not much else happens during their quest, and in the end, They Saved Hitler’s Brain is a thriller without any thrills, and an adventure that’s not the least bit stimulating. The film does have its moments, including a gnarly car explosion early on (easily the best moment from the “newer” footage) and a brief yet intriguing flashback to Nazi Germany, 1945. But aside from these and a hilariously over-the-top performance by Bill Freed as Adolf Hitler (playing both the man and the severed head), They Saved Hitler’s Brain is a movie that will probably put you to sleep.